Eon: I am here again in the physical plane connected with you through this vessel. I am EON, a part of what you call the Absolute. I mean one part, despite being the whole, because it’s only a fraction that is communicating. I must emphasize the willpower of this vessel, which is at 50% of his physical level by a neuromuscular problem, and he is giving all of himself to do this channeling. Interlocutor: Yes, we know it. Well... in the last session you said that now you would talk about the issue of whether or not there was a Creation, that is, if it has always been. Eon: I will try that the decoder of this vessel easily translates my messages. Just as you have the concept that I am the eternal, the immeasurable, you must also know that the known worlds are a physical manifestation of myself and the spiritual worlds – that is, all the supra-universes – are also a spiritual manifestation of myself. Within these dimensions exist time, which is also part of me. In all your writings it has always been said that the spirit is immortal. And this is true, because when the universe ends, the spirit again melts in me, and then a new Big Bang, the creation is back again with all known universes, parallel and alternative universes, but an octave higher, and also is back again the creation of the spirits, with a new awareness, with a new essence, with a new concept, and again they start to grow. 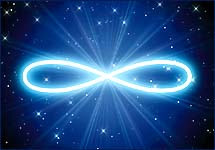 As I am eternal, the eternity from my point of view, of EON, is much broader than yours, incarnated beings, because when I speak of eternity I refer to the various eternities of different universes: Big Bang - Big Crunch - Big Bang - Big Crunch and so on. Creation with the first one". Interlocutor: That’s precisely the point. Eon: Those who believe in impossibility have forgotten that for EON there are no limits, there is nothing impossible. They can be connected perfectly! Eon: Let’s assume that the first strip, which is the first universe, has a millimeter wide, the second strip, which is the second universe, has two millimeters wide, and the last strip, which is the last universe, is going to have one thousand millimeters, or one meter wide. And well, the first strip, of one millimeter, will join with the last strip of one meter wide. And back again to start. Eon: That would be nothing else that an understandable position, but strictly speaking it’s not so, because the octaves are raising the vibrations of the different universes without affecting their operation. Thus, this universe functioning is equal to the previous universe functioning and will be equal to the functioning of the next universe. Simply this universe has an octave higher of vibration than the previous universe and an octave lower than the next universe. But they perfectly join one to the other. Eon: The example is valid… You have understood the idea. I’m now turning to another matter… You are so developed in the physical plane that you really achieve nearly impossible things, of enormous complexity, such as time travel through quantum physics. Interlocutor: We know that the time travel will be achieved in the year 2500 because that’s what the thetan of Kronbus told us, a time traveler of that era that came to our present time. Obviously, I say it so whoever read these dialogues could know. Eon: Because for me all the universes are an eternal present, I am far beyond your understanding. However, you may assume imaginatively this: if there were hypothetically two thousand universes – and don’t take this figure as an approximate number, because it’s an arbitrary amount that I use for the sole purpose of this example – I am in all of them, from the first universe to the last one. Interlocutor: But then… was there an initial universe? Eon: No, there was not an initial universe, because this first universe was the continuation of the last one created. It's like a wheel. There is a metaphor of a philosopher who said that "time is a wheel and the wheel is eternity". Interlocutor: Could it be said that you always existed and that the Creation with all the universes always existed? Eon: That's right, I have always existed and the Creation has always been. Interlocutor: This would mean that we are within time, but not the Absolute. Eon: Of course! Time is part of the Absolute. Everything that is within the Creation is within the Creation; everything that is within the temporary spaces is within the temporary spaces, valid is the redundancy. But you have the technological capability to travel through time,and you have the opportunity to travel, even physically, to parallel universes. Interlocutor: With or without machines? Eon: With machines, that we could call them "teledecoder". Even Johnakan has suggested that theory. Eon: That's why last time I said that Johnakan is a creative spirit. Interlocutor: Yes, I remember you said that in one of the sessions. Eon: There have been small children who have made pranks and have traveled in time. And you put this in your website, as you call it. Interlocutor: That's right. Regarding that… did those children appear in Banjos, Spain, because there are other versions that locate the story elsewhere? Eon: They appeared in that place you mention. Interlocutor: Returning to the subject of the Creation… From your point of view, is the Absolute immobile? I remember you gave us the example of a one liter of liquid in a one liter bottle. Eon: We must first say that there are no limits for me. Then, this has two points of view. On one hand, yes, I am immobile, because if I am the physical manifestation of Creation and I am within the Creation, I contain the Creation and the Creation contains me as well. Then, when the Creation contains me and I occupy the entire space, I am immobile. It’s valid the example that I gave you before about the bottle. But on the other hand, EON is the bottle, and the universe is the fluid, and since I have no limits, I can move and watch all realities. Interlocutor: Could you even make another Creation alongside? Eon: I have the capability of doing that and multitude of unlimited things. Eon: Your question would seem superficial, but it’s not. It could even get me in trouble to answer it. Obviously not, but that’s only a way of expression. I am the manifestation of the whole and therefore there cannot be another whole nor can be two infinites. Interlocutor: Now, I remember a mathematician named Paul Davis, who imagined a hospital where there was one row of infinite beds. Theoretically there could not be more that one infinite, but this mathematician wondered about what would it happen if next to that endless row of beds, they would put another row of infinite beds, in which case there would be two infinites. Eon: That's nothing but math, because in reality there can only be one infinite and one Whole. Eon: No, no one can. whether he sees the filming or the filmed. Eon: He sees the filming and not the filmed, because he could intervene and prevent the assassination. You will see something filmed when you go to watch a movie. The time traveler is not going to a parallel temporary dimension, but he goes to exactly the same time and place where the events occur. A time traveler could prevent the crucifixion of loved Jesus, but as history has already been written, automatically another time traveler would have to intervene to prevent that history is being altered. Interlocutor: Could a time traveler go to see, for example, not the filming, but the filmed? Eon: No, he could not, because he's always within the same time. There is no way out of that temporary space. Interlocutor: I understood. But I'm here right now, I am speaking, gesticulating, I move, breathe, etc. Then, Kronbus comes to this time and knows exactly what I am going to do for the next ten minutes, and he sits comfortably and watches me doing everything he already knows I will do. Eon: Kronbus can know that you, at 9:59, are going to sneeze, but he cannot change anything because that sneezing is already part of the history lived by you. Interlocutor: The question is how Kronbus knows that I will sneeze before I sneeze. Eon: Simply because he comes from the future. Interlocutor: That is to say, I have already done the entire time line and it’s not that I'm doing it? Eon: Thousands and thousands of millions of beings in billions of planets are deciding every day, what I already know, what they will do. Eon: Of course. And I also know what you will do in ten thousand years from now and what you will do in other worlds and what you have previously done. Interlocutor: So in this aspect, Kronbus is like you… I mean that he has the viewpoint of the Absolute. Eon: In that detail, yes. Eon: If you realize that your actions are unique and you are choosing that happy blessed future every single moment, every day, on a continuous basis, with the free will that I give you. There is no predetermined destiny. Interlocutor: The point is that I have the impression that I am taking a path already walked. Eon: That’s just an impression. It’s not real. Interlocutor: What brings more confusion to me is that Kronbus already knows it. Eon: He knows because he's from the future. But it's nothing more than that. You also know that forty years ago it was killed an American president. Interlocutor: Yes, John F. Kennedy. Eon: That's right. That is history and it cannot be changed. Interlocutor: Okay. Changing to another topic, a few days ago I received an e-mail where I was asked about Kryon, a spiritual entity channeled by Lee Carroll. I read some of his channelings and I found texts of true wisdom mixed directly with nonsense. I am a bit confused. Could you clarify me about this issue? Eon: There is a parallel between the book " Conversations with God " by Neale Donald Walsch, in its three parts, with the series of books written by Lee Carroll. The first author channeled me and the second channeled an entity of Light of level 5. Interlocutor: Is Kryon a Master of the 5th level? Eon: That's right. In both authors there is an accomplishment in terms of behaviors, as guideline of conducts, in terms of spiritual growth, but they fail - the second more pronounced - when adding too much of their own nature, originated from religious and spiritual preconceptions. Interlocutor: Are we specifically talking about Lee Carroll? Eon: Both, but in the case of Lee Carroll the preconception is so, but so strong that he lacks humility, wisdom or vision to change it. Then, when mixing the wonderful teachings transmitted to him by that being of Light, with his misconceptions, he has managed to confuse the reader in his books, doing more harm than good, which is contrary to the original purpose of clarifying and raising the reader. You and I, know when the truths are mixed with falsehoods, they may be more dangerous than pure fabrications, because pure fabrications are immediately discovered, but that does not happen when they are half truth and half false. Interlocutor: On several occasions, Master Ron Hubbard has reiterated that concept, so it’s very present… But, does the responsibility fall exclusively on the channeler or in the spirit of Light, which may have had some misunderstandings? Eon: The responsibility is solely of the channeler. Eon: That’s a misconception, because if karma is eliminated, since this is a lesson to be learned and not a punishment, it would also eliminate the necessary lessons that entail it and then there would be no evolution. It has been repeatedly said that everybody has to reverse his own karma and it would be unfair to exempt some of the lessons to be learned. Eon: The karma is not passed from father to son, and there are no planetary karmas. We could only speak of planetary karma figuratively, for example, if a planet is egoistic. You can also talk about karma of a country or family karma, but always figuratively speaking because karmas are personal, as each one is responsible for his own actions. As you say in the physical plane, everyone has to take charge of their own karma. Interlocutor: In one of the first session held with this vessel, Master Jesus said that "each one will emerge by his own effort". Eon: Exactly… Then, when suddenly an author speaks that karmas can be eliminated or transmuted or exchanged for other things – as in recent times, about Saint Germain’s metaphysics, it was said that lightning could remove karma – that author is transmitting misconceptions. Interlocutor: Are we always talking about errors of the channeler? Eon: Yes, errors of the channeler, because if the entity of Light gives a bad message, automatically, his own vibration makes him descend from level. Interlocutor: The question then is why Kryon continued transmitting messages through Lee Carroll if this channeler distorted so much the messages. Eon: Because that being of Light was so eager to convey messages that he always thought that the channeler would finally understand it. As the channeler was adding his own things to it, that being of plane 5, felt so sad, so ashamed, that if he were incarnated, he would literally mourn seas of tears. Interlocutor: But nevertheless, he has continued! Eon: In recent books, Kryon – and it’s not true, as Lee Carroll said that it is an angelic entity or has never incarnated – has practically not communicated and this person has invented everything. This spirit of Light was so depleted by seeing his words changed, that has lately barely communicated anything in the causal body of this author. But the channeler, eager to continue writing, added his own things and therefore his books were crazier. Interlocutor: Specifically, should this book be validated with objections or should it simply be invalidated? Eon: If we were to validate this book, I would validate its beauty, remarkableness, manner and capability of being able to transmit love. But we cannot talk about of transmuting karmas or doing some implants for changing things. It’s absolutely absurd because you are teaching people to be unwise and not to strive… "Why will I change my karma if later some implants will modify it for me?" That means you are teaching people to be passive. Something similar happened with some protestant ideas of the mid-twentieth century of your world, where it was argued that "it doesn’t matter what you do, because you will simply have to regret it at the end of your life and so you will be forgiven". This is absurd! Interlocutor: I understood, and I think I already have plenty of elements to make an honest critique of the books of Lee Carroll… I'm going to ask a question that is a fact: Why is it that almost all women who come in mission fail? Eon: Simply because in the physical plane they are more emotional. I want you to understand the difference between emotion and feeling. The impersonal love is a feeling. The personal love is an emotion. The emotion is susceptible to the reactive mind. And the reactive mind is capable of doing a thousand negative things against that incarnated being. And since women are more emotional, they may be more likely to be trapped on the physical plane by the reactive mind. Interlocutor: The obvious question then is why the spirits choose to be born as a woman, if they are almost certain they are going to fail. Interlocutor: A challenge for vanity? Eon: Not at all… I rather call it a challenge in the sense of "commitment". Interlocutor: Let's see if I understood… do the spirits incarnate as a woman because it implies a greater commitment, since it’s more likely to fail? Eon: Right, that is so. Interlocutor: Well, the point is clarified… Another question: Does the Absolute intervene in Jules Verne's book "From the Earth to the Moon" which tells almost literally, the journey to our satellite that the Americans made a century after? In this sense, the book of H. G. Wells is much more acceptable, where he talks about the antigravity, which is something much more feasible. Interlocutor: How did the time traveler suggest ideas to Jules Verne? Was it personally delivered, as in the case of Nostradamus? I’m referring, of course, to the time traveler named Dominic Litio who contacted that philosopher. Eon: No, it was not done personally, but through the causal body of Jules Verne. Interlocutor: Is it something the time traveler should not have done? Interlocutor: Do we know that time traveler? Eon: No, you don’t know him. Interlocutor: So, his name has no importance. Interlocutor: Do I understand that when you said that the time traveler put ideas into the casual body of Jules Verne, we were talking about the Thetan of the time traveler and not about his incarnated part? Interlocutor: Well, changing the subject… In our historical facts, have you intervened in making "miracles"? Eon: Correct, but it’s an event in which I took part, giving Master Jesus the strength to do it, despite the fact that he was being assisted by the Christic Energy. What Jesus did is what I would call a "miracle", because even though it’s feasible – what you would call a scientific fact – taking things from a parallel universe, it's really just something out of the ordinary. Interlocutor: Did Jesus come into that parallel universe to take the breads and fishes? Eon: No, he did not enter it, he directly intentioned it. Interlocutor: And when Jesus walked on water? Interlocutor: Regarding dreams, which the Masters have already told us enough… Do you know all the dreams, such as mine? Eon: Some dreams are simply electric shocks of neurons so that the mind could rest, although strictly speaking is not for resting… When thinking, there are parts of your brain, or better your decoder, which increase the electric tension more than other parts. Then, when dreaming, you harmoniously re-distribute that unbalanced electrical voltage. Interlocutor: I understand… I remember when I was researching on the so-called "Monster of Loch Ness" I dreamed that I saw mechanical monsters in the River Plate like those of Disneyland… And I learned later, by mouth of the Masters, that the famous "Ness" was only a holographic projection of a monster to drive away any snooper and it was made by aliens who were based at the bottom of the lake. The question is… where did that dream come from? Eon: That dream was dictated by your guides through your causal body so that you associate ideas. Interlocutor: This is also clarified… To conclude, I would like to ask… when I’m writing down on paper these dialogs, am I being assisted in some way by you? Eon: I am always present… but it’s also present your Thetan who has a tremendous work, your guide Ron Hubbard and other Masters of Light, for example Johnakan and others, depending on the topic you're into. Interlocutor: See you later EON and thanks.